Showing results for tags 'powder feeding'. Hi hunters I have finally started, we have 4 little babies making there way to the surface, at the minute 2 have been born to this world as you will see in pics and they were taken yesterday 28th October today abit taller. Im not feeling so good today so gonna make this short will take more pics when other 2 are born. Peace guys. Hi hunters As promised, something from me. We will start from day 14 from cracking seed, the first pics are up to 2 days before switch. In this grow we use 250w hid bulbs at different times untill switch, a mix of mh and hps however not together. Feeding will be GH powder feeding and pk 13/14. Hope you like the pics. Hello everyone, First of all I would like to thank Green House Seeds, Strain Hunters and all the people handling this contest, you are doing an amazing job. This grow will be focused on Money Makers. I planned on 4 growth weeks, then 8 to 10+ flowering weeks according to the differents phenotypes. Let the images load for better readability (many images to be displayed, this may vary depending on your connection.) ================================================================================== (Click on a link to go directly in a post.) Germination - Pre Veg - Veg in post #1. (You are here) Flowering in post #2. Harvest - Dry Buds - Ice-O-Lator - Tips etc... in post #3. ================================================================================== The stuff detail : Room 120x120x200 Dimmable Digital Ballast Lumatek 400W - 600W MH Bulb 600W 5000K° for the veg HPS Bulb 600W 2000K° for the flowering Prima Klima Extractor 160mm 820 m3/h + dimmer Prima Klima Carbon Filter 150 mm Humidifier 6L +Some fans I'll use BioBizz AllMix as soil, and will start the feeding with Powder Feeding mostly Indica after the pre veg. Germination : 05.01.2013 - Day 1 : I soaked 10x Money Maker seeds in 5.5 PH water for 12h. Day 2 : In a closed box with a wet cotton for 24h. Day 3 : 9/10 Germination success after 24h. Pre-Growth : Day 5 : 9 are ok, 1 still missing. Day 7 : 1 still missing, 1 died, the shell of a seed stuck the cotyledon, and have prevented from opening. So they are still 8 Money Makers. Growth : Beggining of the first veg week : Room Temp : 23°C-25°C Humidity : 80%-90% MH Bulb 5000K° Photoperiod : 18H Lights ON - 6H Lights OFF 15-01-2013 Day 10 from germination - Day 2 Veg First time using Powder Feeding Mostly Indica today 16.01.2013 (0.25g/L) PH 5.7 EC 0.53 (Tap water at EC 0.2) 19-01-2013 Day 14 from germination - Day 6 Veg Some new fresh soil for the repot. 23-01-2013 Day 18 from germination – Day 10 Veg 7 Money Maker repotted in 12L Pots 1 Money Maker repotted in 7.5L Pot And I added a little PH 5.7 - 5.8 water The 2 babies on the right are 2 homemade crosses, in testing (will be repotted in 7.5L Pots). 27-01-2013 Day 22 from germination – Day 14 Veg They begin to be a bit stronger, main stems getting stronger too. Will water today with PH 5.7 – 5.8 water 02-02-2013 Day 28 from germination – Day 20 Veg Room temp : 24°C – 26°C Room humidity : 65% - 75% I watered 1 time this week with PH 5.9 water at EC 1.15 (0.75g/L Powder Feeding) Then watered again today with PH 5.9 water at EC 1.4 (1g/L Powder Feeding) I started my usual training on 7 of them, and 1 has been FIMed. 06-02-2013 Day 32 from germination – Day 24 Veg I watered this week at PH 5.9 EC 1.5 they still don’t show any problems, very strong genetics. About the FIMed one she reacts very well, I selected the lower one, in 7.5L pot it seem that’s just what she needed. The FIMed one 10-02-2013 Day 36 from germination – Day 28 Veg I watered this week at PH 6.0 EC 1.5-1.6 This is the last veg day I will now switch to Flowering photoperiod 12h on 12h off with a 600W HPS 2000K° bulb. Next updates will be in post #2 (Flowering). Starting a new grow of 16 Masa Critica BCN. The description raises a lot of hype of high yield with short flowering time but with taste, aroma, and potency. I purchased this strain with the intention of using it in a low clearance for root to fruit, aeroponic, vertical, scrog but decided I would also run some through ahead of time to size it up against with my most successful to date growing method and the BDS Special and Kush plant I've been harvesting with great rewards! Anyway, here is the 1st tote, already starting their week of Veg before flower in their habitat. Already, they're quite healthy with a very short inter-node space. They're a 75/25 Indica dominant Big Bud crossed with Afgani Skunk These plants are currently under a 600w MH being moved there from a table with a 6 bulb T5 seen here: I just finished the other growing chamber this evening so I have the opportunity to show you a little more of how I assemble it. First, this is made of a 27 Gal tote which I purchased in the US at a Home Depot. I modify the top of the tote as seen here: Notice above, the very edge of the lid is black and the majority of the lid is white. As the lid starts out as Yellow, I paint it black to block out light and then paint it white to reflect light and avoid unnecessary thermal energy in my res. I just ran out of white paint for this lid so I'll finish it next cycle. In this design intended for a very short veg period, I have 8 3" net pots with neoprene plugs and two 1 7/8" holes for wires, gauges, air hoses or whatever else I need to pass into the res. I use a basic window and door self adhesive seal found in the weatherization aisle of Home Depot like this one which can be peeled into two separate seals which cover two boxes. It also makes it easier to turn corners without creasing the seal. Notice the light blue mess around the outside of the seal? That's OSI Quad petroleum based caulk. I use it often on homes and is an amazing product! Sticks like glue and remains permanently flexible. This stuff is blue, left over from a house I worked on. I'm lucky that 3" net pots with the lid available to me is perfect for this lid and hole size to easily be able to chisel out a retaining notch where I can clip my net pots into which secures the plant for the duration of the grow! I built this pvc manifold and attached it to a 395 gph submersible pump. When left on the floor and the A/C running I can maintain a res temp between 63*F and 70*F I will be using the entire GH Flora Seriese and additives but I suppliment with super thrive, House and Gardens root stimulater, Shooting Powder and Cal Mag if necessary; I have a relatively high ppm in my well water tap at 240-280 ppm and don't normally need it unless using coco. Most of the GH Flora nutes will be at or near 1/2 streingth as it always seems high for some reason. Beginning PPM is around 800 however 250 of that is from the well water. PH is currently set to 5.6 and I'm fine with anything from 5.5-5.8 at this time. My next cycle to compare is likely to be with the powder feeding line. I hope it can show up the GH stuff so I can KISS! I use two large air stones for the res Lastly, I swear by this short cycle panda timer where each slot represents approximately 40 seconds. I start with fresh clones at 40 sec on / 40 off and gradually work up to 1/6 on up to only 40 seconds every 20 minutes later in flowering. They are part of the reason I can get this on only my 4th day. I will be filling up this new unit with 8 more of the best of the critical mass plants from this cloner which a friend got started for me. I will keep you guys updated on my progress as I can. I hope you enjoy the show! Hello everyone! This is my first grow journal. For various reasons I'm starting it a little late (2 weeks in flowering), but hey, it's better late than never. This is my first grow using COCO as a substrate, so I was bound to make some mistakes. There were some PH fluctuations in the vegetative stage due to uncalibrated PH meter, but everything seems far gone now . This is also the first time I am using Greenhouse Powder Feeding (I got the idea off a friend, whos plants were looking very healthy). I had a plan in my mind for some reason that I would use the Mother Plants one in veg and then switch to Hybrids, as my strains are mostly hybrids. The strange thing that I encountered is that , using the mother plants feed, the girls were kinda slowing down on growing at the end of the second month and just making their stems at the bottom more wide ... or I was hallusinating maybe. However when I switched to the Hybrids feed and along with that switched the cycles - they exploded and some grew like 20-25cm in 3 days. Or maybe it was the pruning all alone... Overall the VEGETATION lasted 2 months and a bit. However for various reasons, the plants were in 1 liter pots for the first 3 weeks so that slowed down the growth. I also had deficiency issues in some plants, of different sorts and I always give them more time to heal. The issues slowly went away when I started feeding them with nutes EVERY OTHER TIME. I will be grateful for every and any advice on the project! : ) THE SETUP Room: 2m x 2m x 2m Buddha box Lighting: 8 x 300w LED panels (180w real usage), 3 watt Epiled diodes - 630nm -16pcs, 660nm -16pcs, 460nm -16pcs, 470nm -16pcs, 3500k -18pcs , 7500k -18pcs In a few days I will put 3 or 4 panels more in the less lit areas, just for fun : ) Ventilation: 1 Vents TT 150 extractor 520m3/h Carbon filter 600m3/h+ Moving fan 30W Substrate: 50% Coco coir/ 50% Perlite, presoaked in 1ml/l Calcium solution, RootIT sponges for the seeds, 11 liter PVC pots Feeding: Greenhouse Powder Feeding - Mother plants (veg), Hybrids (flower) - roughly 3 literes per plant - 0.5g/l first 2-3 weeks in the pots, then 1g/l every other feeding. PH according to the GH scheme for every week. Every week 10 liters flush with PH water, + 1ml/l Calcium the first feeding after Strains: 7 x Liberty Haze, 1 x Skywalker OG Kush, 4 x Cinderella 99, 2 x Critical Kush, 2 x THC Bomb, all fem (may have some GH Cheese also, dunno) All plants have been topped, rather late, and they have been "lollipopped" 80% right on the cycle change. Here are some low-q pictures of the girls, these days will post some decent ones: Stay healthy and be happy! Hello everyone, First of all, as usual, I would like to thanks Green House Seeds, Strain Hunters and all the people handling this contest, you are doing an amazing job. This grow will be focused on Auto-Bomb (Green-O-Matic x Big Bang Auto) and Sweet Mango Auto (Mango x Big Bang Auto). Two different crosses of Big Bang Auto, I already grown it and I liked it, was a very fragranced fruity smoke. I’ll use a regular photoperiod for this grow even if they are autoflowering, so it will start at 18h/6h at 250W 6400K° CFL bulb, then still 18h/6h at 600W MH 5000K° bulb after 2 to 3 weeks, then when the first flowers are out 12h/12h at 600W HPS 2000K° bulb. I'll use BioBizz Light mix as soil in the pre veg/veg, then AllMix when I repot, and will start the feeding with Powder Feeding Short Flowering (same as Mostly Indica) after the pre veg. The stuff detail : Room : Germination/Clones/Pre veg/First veg weeks 60x60x100 250W CFL 6400K° Bulb Extractor 150mm 300m3/h Humidifier 2L Pots Room : Last veg weeks/Flowering 120x120x200 Digital Ballast Lumatek Dimmable 400W - 600W 600W MH 5000K° for the end of veg 600W HPS 2000K° for the flowering Prima Klima Extractor 160mm 820 m3/h + dimmer Prima Klima Carbon Filter 150 mm Humidifier 6L 7.5L Pots +Some fans So I selected 4x Auto-Bomb and 6x Sweet Mango Auto. 11-04-2013 - Day 1 : Soaked in PH 5.5 water for 24h. 12-04-2013 - Day 2 : In closed box with a wet coton for 24h (some are open already). 13-04-2013 - Day 3 : 100% Germination success. 19-04-2013 - Day 9 from seed : 250W CFL 6400K° 18h-6h Day : 24°C Night : 20°C Humidity 80% 27-04-2013 - Day 17 from seed : 250W CFL 6400K° 18h-6h Day : 24°C Night : 20°C Humidity 70% 04-05-2013 - Day 24 from seed : 600W MH 5000K° 18h-6h Day : 24°C Night : 20°C Humidity 60-65% Fed at PH 5.5 EC 1.5. (Yellow sign = Auto-Bomb, No sign = Sweet Mango Auto) 11-05-2013 - Day 31 from seed : 600W MH 5000K° 18h-6h Day : 26°C Night : 20°C Humidity 60-65% Fed at PH 5.6 EC 1.6 this week, they are stretching already even with the MH bulb. They show their first pistils. 18-05-2013 - Day 38 from seed : 600W HPS 2000K° 12h-12h Day : 26°C Night : 20°C Humidity 50-55% Fed at PH 6.0 EC 1.6 this week, they are going fast. 25-05-2013 - Day 45 from seed : Day : 26°C Night : 21°C Humidity 45-50% Fed at PH 6.1 EC 1.6 this week, they love powder feeding. Some are a bit faster, already some nice little flowers. 01-06-2013 - Day 52 from seed : Day : 26°C Night : 21°C Humidity 45-50% Fed this week at PH 6.2 EC 1.6, the tent start to fill up The tall Sweet Mango has stopped stretching (fortunately) 09-06-2013 - Day 60 from seed : Day : 27°C Night : 21°C Humidity 40-45% Fed at PH 6.3 EC 1.7 this week, I had to manage some hot temperatures, but they don't seem to be disturbed 16-06-2013 - Day 67 from seed : Day : 28°C Night : 23°C Humidity 40-45% Fed at PH 6.4 EC 1.8 This week. The Sweet Mangos are a bit faster than the Auto Bombs. On the pictures, the 4 in front are Auto Bombs, the 6 other are Sweet Mangos. They begin to gain weight, smell so good already. 23-06-2013 - Day 74 from seed : Day : 25°C Night : 21°C Humidity 40% Temperatures are back to normal, I fed them at PH 6.5 EC 1.8 this week and until final flush. The smell is more and more present, Sweet Mangos are still faster than the Auto Bombs. But Auto Bombs got "longer" buds. The 3 last pictures are Auto Bomb buds, all the other are Sweet Mango. 30-06-2013 - Day 81 from seed : Day : 25°C Night : 22°C Humidity 35-40% I did the last feeding this week at PH 6.5 EC 1.8 and will now start the final flush for 7 to 15 days at PH 6.5 EC 1.3, then EC 1.0. The leaves start to turn yellow, the end is near 07-07-2013 - Day 88 from seed : Day : 28°C Night : 23°C Humidity 35-40% I flushed them at PH 6.5 EC 1.3 then PH 6.5 EC 1.0. The fastest SMA has been flushed for 8 to 9 days and harvested today. The rest will follow this week or next week end. Harvest : - Sweet Mango : SMA 1 - Day 88 from seed. SMA 2 - Day 90 from seed. SMA 3 - Day 90 from seed. SMA 4 - Day 92 from seed. SMA 5 - Day 94 from seed. SMA 6 - Day 95 from seed. - Auto-Bomb : AB 1 - Day 92 from seed. AB 2 - Day 94 from seed. AB 3 - Day 95 from seed. Dry Stuff : - Sweet Mango : - Auto-Bomb : Dry Weight : SMA 1 : 26g SMA 2 : 33g SMA 3 : 38g SMA 4 : 34g SMA 5 : 30g SMA 6 : 32g AB 1 : 24g AB 2 : 24g AB 3 : 26g Powder Feeding Leaflet : For those who don't have it, maybe it can help. Click on a picture, then you can save it. Tips : Some tips for Auto Bomb and Sweet Mango Auto strains : -Auto Bomb : I noticed they react better if you water them with "cold" water. Because if you water them with tempered water (like 22°c), they may have the leaves dropping down after watering. 7 to 10 more days would have slightly increase the yield. -Sweet Mango Auto : React very well on both cool and tempered water. If you cut the lower branches you will have a big main bud so they react well to this. (But not recommended on a Auto). Smoke Report / Effects : -Auto Bomb : Hits strong and relaxing in same time, good for daytime if you are stressed or for bedtime. Fruity candy smell and taste. -Sweet Mango Auto : Hits strong, long lasting, good for daytime/bedtime. The smell is complex, Mango and milky sour fruits. Taste is like sour fresh mango, very fruity. Thanks for watching. -Peace. 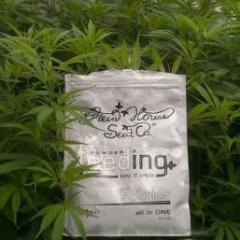 Free kit for the Autoflowering Cannabis World Cup 2013 10 x Sweet Mango Autoflowering (Feminised) from Green House Seeds Co. 1 x Grinder from Green House Seeds Co. 1 x Wallpaper from Green House Seeds Co. 1 x Powder Feeding Short Flowering (Mostly Indica) 1 x Powder Feeding Manual 1 x Powder Feeding Keychain Big Thanks! hi all you strain hunters out there I would like to no what additives and Bloom Boosters you use with Green House powder feeding what ratio you use and what type's ????? greenomatic87 - GHSC powderfeeding VS General Hydroponics flovanova offical report.